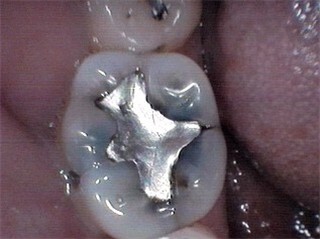 Cracked tooth seen under magnification of Intra-oral camera. Please note a small amount of easily removable colored liquid was placed on the tooth to allow better visualization of the actual stress fracture. During treatment, photographs of the patient's mouth are displayed on a large high-definition monitor showing the clear progress of treatment. This can be done with a traditional camera or with a wireless Intra-oral miniature camera that allow us to see otherwise hidden areas. It is a painless, non-invasive procedure that greatly improves our view and your understanding of our dental recommendations for treatment.